Rebecca from North Carolina wrote to us recently: "About a week ago I was given a baby eastern cottontail. I have been feeding him goat’s milk and Kitten Milk Replacer formula for a few days now. I started him on cecotropes yesterday." What's a cecotrope, and is Rebecca following a plan? Yes. The real 'bunny- whisperer' is Lou Rea Kenyon, creator of Squirrelworld and a licensed wildlife rehabilitator. With her permission, we’ve referenced her website on ours, because no one knows orphaned bunnies like she does. Review our Feeding Wild Rabbits page for how to take care of and feed wild rabbits. You’ll most certainly want to also hop over to Ms. Kenyon’s Squirrelworld and get the full scoop on raising orphaned bunnies. Chances are the visit to her site will help save the life of the critter. But the visit to Feeding Wild Rabbits is not for naught. You’ll find links to nearly everything the little orphan bunny will need, all on the same page. Rebecca’s email to us concluded, "Your site has been very informative. I was delighted to see that you had information from Lou Rea Kenyon. Mrs. Kenyon's website helped me a lot, and was the first source of info about cecotropes I found. I'm certain if I hadn't discovered it my little bunny wouldn't even be alive right now. Thank you for the info you've provided, it has been absolutely invaluable." Thank you Rebecca, your comments are what it’s all about. Rabbit breeders sometimes end up with orphaned domestic bunnies. Very little in the life of a rabbitry is sadder than waking up to a dead doe with 8-day-old, lively, and hungry, kits in the nestbox. Hopefully that occasion is rare. The cause is usually enterotoxemia or a latent infection somewhere in the doe. If the stress of pregnancy and lactation drains the immune system sufficiently, the infection or diarrhea can fulminate, flood the doe’s body with septic toxins, and she can die quickly. 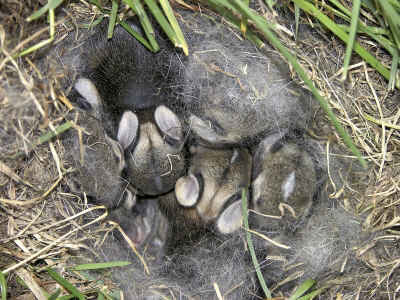 See Rabbit Diseases for more info. Does Animal Meat Leach Calcium from Bones? Dr. Al Sears, a prominent MD who includes natural health in his practice, has recently written a very informative article about the affects of animal protein vs vegan protein on our bones. Results from new and definitive studies are in, the numbers have been crunched and graphed, and the results are dramatic: Animal protein builds bones. No question. And vegan protein? Because it is incomplete--lacking some of the essential amino acid building blocks--the process breaks down at the point of shortage. Result: significant overall bone loss on a vegan diet, despite supplementation with calcium. Yikes, how could the early researchers have gotten it so wrong? The human body requires both meat and vegetables for optimal health. We need animal protein (meat, dairy, eggs, fish) for building the body and for energy, and plant protective phytochemicals to protect and preserve health. We need them both, in moderation. Next time you visit Raising-Rabbits, you’ll find a Facebook box on our home page. Feel free to click the ‘like’ button! We’ll be honest - we’re still learning the social media thing, but we’re confident we can catch up fast. It is very rewarding to be able to interact with those of you whom, until now, we’ve known only as an email address, so thank you in advance! 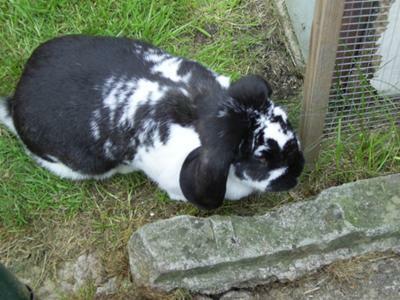 Brigid from the UK sent us pics of her pet French Lop rabbit, Dotty, and Dotty’s new bunnies. Very cool -- thanks Brigid! Your friends at Raising-Rabbits.com wish you a wonderful July.